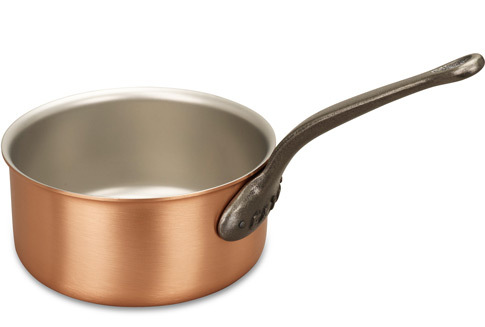 We know you'll love this	20cm copper saucepan	as much as we do. This 20cm has become my instant favourite in two days! Thank you for lightning fast delivery. I have used this pan 3 times within two days of receiving it! I have other copper pans but was looking for an 'everyday' size for stews or meat & veg hotpot which my family likes. I am also addicted to cookware. With this pan I seared the meat in high heat before adding the stock and vegetables. The meat browned quickly and did not stick on the matt finished interior. I found the ergonomics (which are important for heavy pans) are better than the other two brands of copper pans which I use. What this means is that I will be reaching out for this pan more and more.. and buying more Falk products in the long run. 1053 customers found this review helpful. Did you? Yes, I did! Bigger than one might expect I was not sure whether the saucepan would be big enough to cook soup for four, difficult to tell from pictures and dimensions; well, it is pretty tall and can make soup and pasta for more than four. The handle is a little bit too high for my taste and will have to get used to it. The finish is, as with the rest of Falk pots, very good and all of them look and feel as part of the same family, which is really nice. Good All Rounder Excellent family size, cooks very evenly at all temperatures. Well engineered product with a high quality finish, will last more than one lifetime. 992 customers found this review helpful. Did you? Yes, I did! Fabulous Copper saucepan Talk fantastic cooking with Falk! My family are so pleased with our super new Falk saucepan - great for producing lovely stews, soups and curries. Our kitchen is benefiting from this lovely new addition - thank you Falk for such a beautifully crafted product, The Smyth Family recommend you! Workhorse of a pan This is an absolutely fab saucepan. I got the 20 cm casserole as well however that one is good for the oven whereas this is excellent for the stove top. They're exactly the same except the handles. Any visitor to the website will no doubt be aware of the benefits of using copper for cooking. I was sceptical, however the proof is in the pudding - my dinner party guests keep saying how they cannot understand how my curries can taste just like restaurant ones. Good size - 24 cm ones are for boiling whole zeppelins in. This one's big enough without bumping into all the other pans. Fantastic buy I bought one of Falk's pots after reading some great reviews about the pots and the service from Falk and I am glad I did - I now have 5! I use an electric cooker and induction hob at home and these pots conduct the heat brilliantly, heating up and cooling down quickly. The service from Falk Culinar is great and we always recieve our order quickly. I feel this wont be my last order. Another useful piece..... thank you Faulk Culinair....this pan has had many uses already and makes for a very versatile addition to the collection. Customer service from Neil was superb. good pan Good pan, useful size. 947 customers found this review helpful. Did you? Yes, I did! Good all rounder I always want to use the word "robust" when I think Falk Culinaire. It is robust and can be used for veg, soup,casseroles - whatever you want really. Great All Rounder Excellent product and great temperature control. Highly recommended. 928 customers found this review helpful. Did you? Yes, I did! Excellent Quality. Looks Wonderful Arrived next day. Excellent quality. Really robust handle. Beautiful addition to my kitchen and great to cook with. Lovely versatile pan A good all-rounder. Copes with whatever you need it to. Sturdy - but not too heavy - and looks great. When combined with a lid, makes cooking a joy. Simple and perfect I purchased this saucepan to replace my old steel pan as it started showing the signs of wear. I didn't regret my decision for a moment - this pan is great size, quick to heat up, has a long handle for the ease of use. When fully filled can be a bit on a heavier side, but easy to get used you. Overall, love it, use pretty much every day for anything from soup, boiling veggies, making sauce or cooking grains. 828 customers found this review helpful. Did you? Yes, I did! Beautiful saucepan, very handy size I love this saucepan and find it a great size for simmering vegetables. It's beautifully made and looks great hanging in my kitchen. All Falk Culinair items are very easy to clean and polish up, but develop an even more beautiful deep burnished colour with use. Would recommend any of their items to anyone who can afford them. I feel the price is justified as they are an investment for life. My new favourite saucepan I bought this 6 months ago and I have barely used my other saucepans since. It's a great size, a beautiful object and oozes quality in weight and finish. Great pot We own a whole series of Falk pots and use them all depending on the size needed. They all work great and this one is no exception. Strongly recommended! Good choice This source pan I like to prepare pasta for two people! Amazing design! I recommend it!